This is a very simple cheese press to make. Let’s take a look at the different part included. The base and the top is pretty much the same. A piece of 3/4 plywood, with 4 square legs. The measurements is 12″ x 16″ for the ply wood pieces and the corners are 2 1/4″ x 2 1/4″ x 1 1/2″ tall. On the bottom plywood, I added an extra leg in the center, to make sure it would be properly supported when using high pressure, which is needed for cheddar cheeses and such. I made a frame on the bottom part to keep the whey from running all over the place. The frame inside measurements are 8 1/2″ x 10 1/2″. That’s plenty of space for my 7″ mould or for 3 smaller moulds made from 4″ pvc pipe. 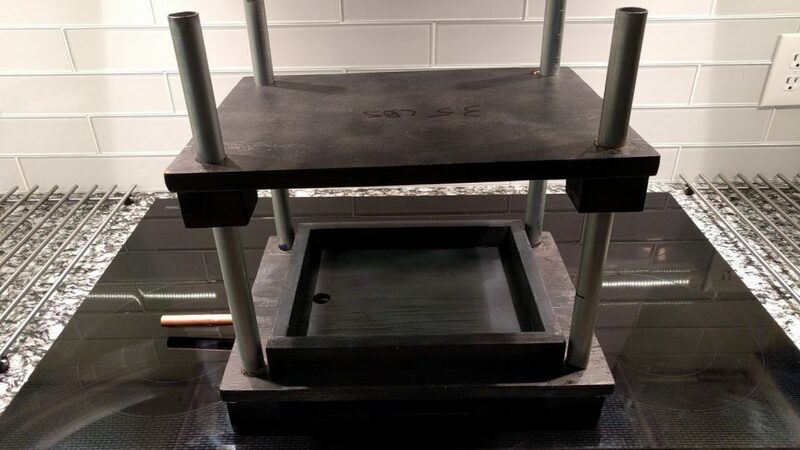 I drilled a hole in the plywood inside the frame, and fitted the drain with copper and cpvc fittings. I just epoxied the parts together. So now I can hove the press sitting next to my sink, with the spout over the sink, and whey dripping into the sink. For the tubes I used electrical conduit pipe with an 7/8″ outside diameter. The top corners was drilled all the way through, and the bottom corners only about 3/4 of the way, so the metal will not go through and scratch my counter top. Make sure to treat the inside of the bottom whey frame with a thick layer of either lacquer or epoxy. The plywood will fall apart over time if you don’t. What I like about this cheese press setup, is that I can find all sorts of stuff around the house and use for weights. I have a Home Depot 5 gallon bucket and a $4 bag of rocks, which will do it for most of my cheeses. I simply put the bucket on the scale and add rocks until the desired weight. I just finished a Derby cheese, which required a large amount of pressure. I had my bucket of rocks, also filled with water, 3 milk jugs with water, and 2 cinder blocks stacked on top of the press. That was a total of 160lbs! I kept the press on the floor (just in case) but it was a pretty solid setup and worked great. Some chease makers make their press with only two pipes, and that would never have worked with a weight like I just used.